It has been said (many times!) that “you are what you eat”. Wouldn’t the world be a better place if we were all a little nuttier and a little seedier? Granola is known far and wide as a healthy food. It is also easy and immensely satisfying to make. Within certain limits, you can wildly indulge your creativity and whims whilst baking up a batch. Optional flavouring agents include orange or lemon zest, vanilla, cinnamon or nutmeg, finely chopped fresh ginger root …. Mix well and spread thinly on baking trays. We use parchment paper on the trays – guaranteed not to stick! Bake at 350 degrees F (sorry, Dad) for 30 minutes until dry and lightly browned. The most important, unalterable part of this recipe is it must be stirred well every 10 minutes! 1 – 2 cups of dried fruit – mix it up! We use raisins, golden raisins, currants, dried cranberries, sliced apricots (very pretty) and even goji berries! Keeps indefinitely as long as it is cool and dry. For those who are eating gluten-free, there are a variety of flakes which can be substituted for oats. As a farewell note, I did promise someone to post our date square recipe this week, only to realize later that it is already up! Kate posted that on Aug 12, 2012 with one of her lovely photos. 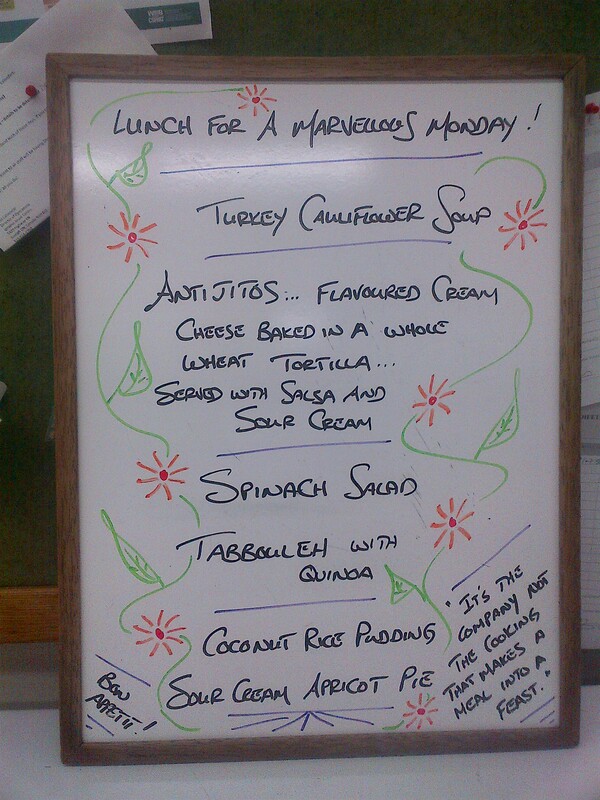 As an additional final note, this week’s photo is one I took of one of our daily menu boards. We try and keep them interesting by including little quotes and quips and words of wisdom … I am always searching for more of these on the themes of health, food, spirituality or philosophy <hint, hint>.